The need to use golden words weighs one down the most at the initial stages of being introduced to these gems. At the onset of adulthood, most of these words alienate the once eager user. Rudeness often confused with authoritativeness is almost always used kicking politeness out of purview. Somewhere along the way, manners take a backseat and a steely resolve to succeed with a complementing tongue ends up in the driver seat. This impolite driver promises to drive you places and manages to keep its promise every once in awhile. This lasts until a prospective employer materializes in his (or, her) line of vision. On occasions such as this, the driver brakes really hard and scampers around for a dictionary. Please, kindly, thankyou, could you….words which are long dead and cold in one’s vocabulary are unearthed and liberally utilized. But then, reforming a drunk truck driver into a polite man is not an overnight task. Knowing this, you are always unsure! Thanks to momma technology which still has the patience and ability to tame you at this stage. 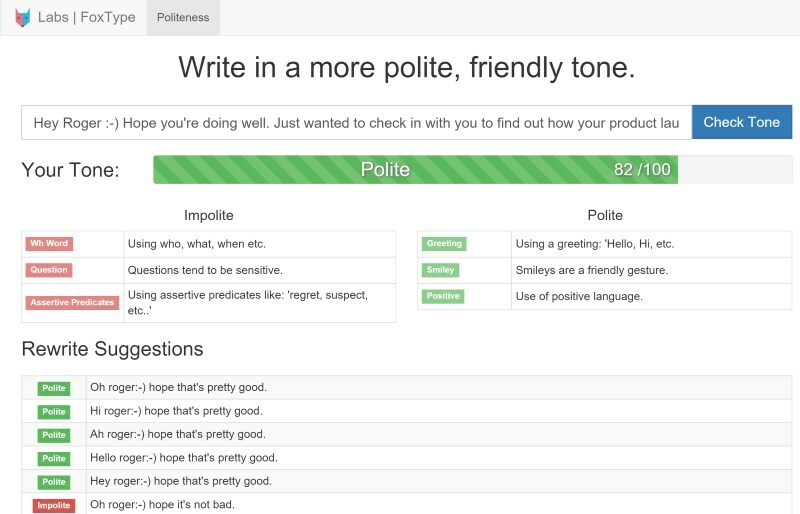 FoxType’s Politeness would whack you every time you type an impolite message. This politeness checker is one of a kind and is exactly what we all need. A quick trip to this polite checker site may help you seal a deal with your dream company. Paste or type a sentence and check your polite score, it is as simple as that. A lousy or gleaming score would not make much of a difference as it always is full of suggestions. It politely suggests polite replacement of your impolite (or, your almost polite) sentences. Alex Jiang and Motoki Wu, creators of the FoxType have designed this handy tool well knowing the growing need to be polite. May it be a text message or an email, rudeness has never got anybody anywhere. So while we all have been heavily relying on spell checkers, we now have a new reliable partner which would keep our impolite tone in check. Drop them a mail and enjoy it as an extension saving yourself the pain of frequent trips to their site. In the years to come, we can completely hide behind the facade of technology. This mother figure over a period of time has guarded our deepest secrets such as our lousy spellings, slack tones and in future, it would continue to do so by curtaining our inability to string words into a sentence. Welcome to the world of deception! But then, one of the aforementioned employer would definitely want to meet you one day (being bowled over by you politeness) and the jar of worms in the form of your impoliteness would be out there for the world to see. Moral-Learn your manners while time is still by your side!